Elizzabeth Hope: Last Minute Lizz : 4th of July Edition! Well, I might be known for putting off things till the last minute (but really who is ALWAYS on time?). This is where Last Minute Lizz comes in for the win! An expect (*LOL not so much) guide to your last minute ideas! Today I'll be talking about last minute Forth of July ideas! Since tomorrow is the 4th and you were conveniently asked to go to your best friend or family BBQ but don't want to come empty handed here's a guide to last minute treats to make the night before or even the day of! OR!! Or are you the host and totally didn't get enough decorations to entertain your guest? Don't worry! I got you covered! Pretzel + White Chocolate + M&Ms + Sparkles = Your best last minute treat! I've made these cute treats so many times for parties and they are always a hit! Who doesn't love pretzels and chocolate! 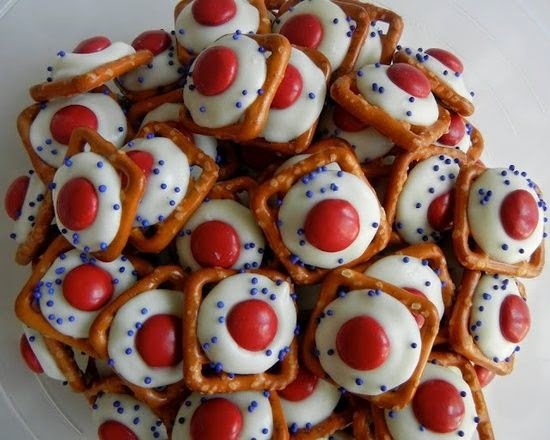 All you have to do is get square pretzels, white chocolate Hershey's, pick out the red M&Ms, and some blue sprinkles! Or blue M&M's and red sprinkles! Put the white chocolate on top of the pretzel...put them on a plate and into the microwave for about 20 seconds (really depends on how strong your micro is! Just until the top half melts!) Take them out and place a M&M on top with a few sprinkles! TaDa! Now, my tip would be to put them in the refrigerator for about a half hour/hour so that the white chocolate doesn't totally melt in this heat wave we've been having! Ahhh...the strawberry dipped in chocolate! White Chocolate! So easy and a sure win at a party! 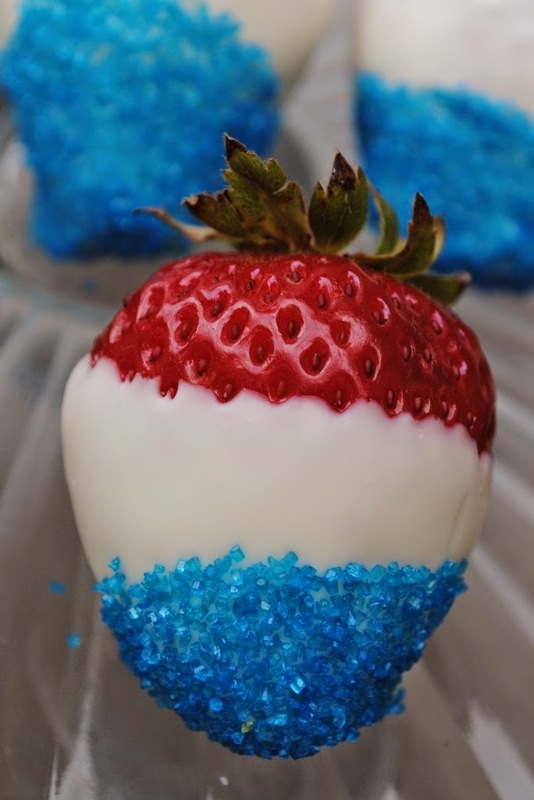 All you need to do is melt down white chocolate chips, dip the strawberries into it and spring on blue sugar or sprinkles! As you can or cannot tell white chocolate and sprinkles/sugar are a sure win-win products here! This has got to be my favorite last minute decoration idea! Magic flowers! Take a vase (or mason jars! Even cuter!) full them up with water and add red or blue food coloring to them. Buy some white carnations (or any white flowers) and watch the food color color the flowers!! 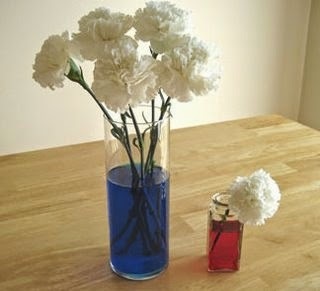 At the end of the night let your guest take home a flower but tell them to put the opposite color and see what happens! Well that's all I have for you today! 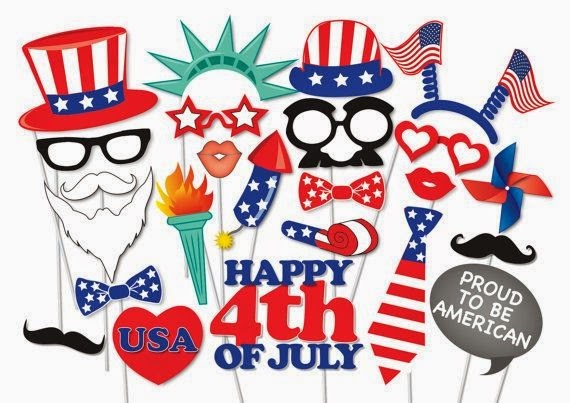 Tell me your last minute 4th of July ideas or party ideas!! !